What are ingrown nails (onychocriptosis)? Ingrown nails occurs when one of the sides or both are closed to the skin when growing, it’s very common at the first toe but they can also cling to the smallest fingers. When the nail crashes, it causes irritation to the skin causing inflammation, pain and in more serious cases, a granuloma that can trigger an infection. The nails are convex structures formed by cells that contain keratin, which main function is to protect the distal part of the finger and favor a functional unit that allows walking and having touch as a prismatic organ, grabbing, scratching or ticking. Granuloma it’s a very nasty fleshy, spherical and inflammatory tissue on a lateral edge of the finger. The finger, when detects the nailed nail, acts against the same causing a proliferation of cells by the activation of the immune System. Why is the ingrown nail produced? Badly cut nails, is the most common cause. It’s not correct to cut more than what’s normal because we could leave a spikes on the canal and when the nail grows causes it to enter more into the skin. In those cases we recommend to go to the podiatrist, although we think that it’s just a little thing because we could solve the problem in a pain free and easy way. Another very common cause is having a biomechanical alteration, which is, not supporting the foot when walking well, since that can irritate the unguial channel due to undue pressure on the footwear or between the fingers. There are deformities as the bunions (hallux vagus) that cause and hyperextension from the first toe when walking and that will favor the nailed nail. The excessive claw toe when walking it does not facilitate toe flexibility and the pressure with the nail on the footwear. Other causes to consider are nail malformations and or the traumatisms. Nowadays society practices more sport every day, blows, footsteps and irritation of footwear are commonplace. So we recommend to visit the podiatrist, because is the persona who will help to foresee possible future effects. . There are different methods for the nailed nail, they include the more classic treatments to the surgery. It is effective whenever there is little inflammation, absence of granuloma and pain allows us to work on the nail without making suffer the patient. With podiatric instrument, we try to perform the correct cut with the extraction of the speculum and with the recommended medication for each case, expect an early recovery of the patient. Surgery it is recommended when there is usual and chronic pain, when the patient is looking for a definitive solution to the problem. How it is the operation? 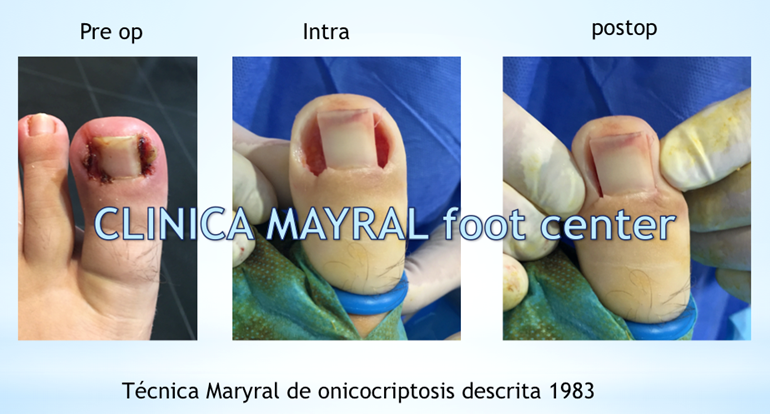 At CLINICA MAYRAL foot-center, third generation of podiatrist we are experts in surgery interventions for the nailed nail with an easy surgical intervention with local anesthesia. In 1983, Agustí Mayral, Jordi’s Mayral father, CLINICA MAYRAL foot-center director, realized a surgical process that nowadays, with technological help, it’s even better. The surgery is performed with local anesthesia at the affected finger. This surgery has de advantage of eliminating the incarnate nail or ornichoprosis, with the scalpel, respecting the epic and hiponique. The aesthetic result guarantees us and the positive results are immediate. Caustic elements are not used to eliminate the matrix of the nail as these cause a delay in their care. After the surgery it’s possible to walk immediately with a special footwear. In those images it’s possible to see the picture before the intervention, during the same where the nail is pierced and where granuloma were eliminated, and the final vision of the finger before the post—operative bandage. The aesthetic results guarantees us and the positive results are immediate. We performed thousands of interventions with a healing of 7 to 10 days after the intervention. This facilitates a fast incorporation of the foot into the regular footwear and the sports practice almost immediately.